Derrick had a bad heart (four heart attacks by age 27), but Emma fell in love with him anyway. The result was ... well, you'll have to listen to the podcast because I don't want to ruin the story. In case the stories made you cry too, it's only fair that I leave you with something funny. This story is about a newly-engaged couple named Brian and Vanessa (the narrator). A beautiful, new love-rival showed up: Malou. She was instantly smitten with Brian and latched onto him. Brian returned her affection. Naturally, Vanessa became Malou's enemy number one. The result is humorous, and a bit painful, but not in the way we would expect. If you like personal stories, try The Moth. You can listen to The Moth Radio Hour on your local public radio station or The Moth Podcast online. 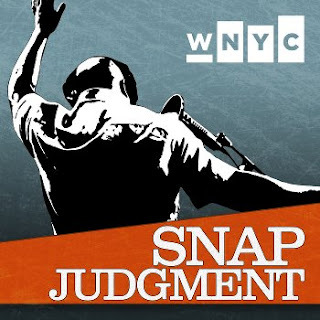 Their stories are similar to Snap Judgment (first person narratives), but usually longer and told live before an audience. For those who like story #2 and prefer visuals, try the movie The Big Sick. The rom-com is funny, cute, and touching. All done with a light touch. And most of all, it's true.